I want to deviate from our theme and share with you an overflow from a Quiet Time my wife, Becky, shared with me and encourage me to read based on Psalm 37:5(b) (NIV) “…He will do this.” The following quote is from Streams In the Desert by L.B. Cowman (updated by Jim Reimann): “I once believed that after I prayed it was my responsibility to do everything in my power to bring about the answer. Yet God taught me a better way and showed me that self-effort always hinders His work. He also revealed to me that when I prayed and had confident trust in Him for something, He simply wanted me to wait in an attitude of praise and do only what He told me. Sitting still and doing nothing except trusting in the Lord, causes a feeling of uncertainty, and there is often a tremendous temptation to take the battle into our own hands”. This spoke to me in several different ways. First of all, I know that I have been guilty of many times trying to help God accomplish what I asked him for. Who am I to think that God needs my help in anything, not to mention fulfilling a promise He has made. I need to always sit back and do nothing but trust in, do good, dwell in the land, delight in him, commit my way to Him and “He will do this”. My prayer is that I will wait and trust in Him and Him alone and not try to help Him. The commands that he gives in verses 1-5 is what He will bring about in addition to whatever we have asked Him for. In what little Hebrew I know, these things the Psalmists writes inspired by God himself, are not suggestions but commands. I have spent much time in this Psalm as shown in the margin notes and underlined scriptures from 3 Bibles I have used over the years, yet I am amazed how it spoke to me today! Read the entire Psalm underlining the commands, trust, take delight, etc. Meditate on words that jump out and write out in your journal how each applies to you and last of all remember “He will do this”! You can take that to the bank!!! Today we look at the fourth principal in One Month to Live as pointed out by Kerry & Chris Shook: JESUS LEFT BOLDLY. 2 Timothy 1:3-5 (HCSB) says “I thank God, whom I serve with a clear conscience as my ancestors did, when I constantly remember you in my prayers night and day. Remembering your tears, I long to see you so that I may be filled with joy, clearly recalling your sincere faith that first lived in your grandmother Lois, then in your mother Eunice, and that I am convinced is in you also.” The Apostle Paul mentions the legacy that was passed on to Timothy by his mother and grandmother. Faith cannot be passed on like a piece of property. How do we get faith? Even the faith to trust Christ as Savior? Our faith is a gift from God to receive Jesus as Savior. We then grow in faith, or at least we should grow until God calls us home. Timothy’s Mother and Grandmother taught him about Jesus and God gave him the faith to receive Jesus as Savior. Stop here and ask yourself; Am I growing in my faith in Almighty God? If so praise him for the things that He is using to grow you in your faith. If not what must I do to grow? Why should I grow? Most everyone who reads this QT know the answers, so it is a matter of JUST DOING IT! God wants all of us as Believers to grow in our faith until He calls us home to Heaven! Believers should help others to grow in their faith. Doing this is leaving a spiritual legacy. If you had one month to live, would you help others to grow in their faith? By helping others grow, guess who grows the most. We who are helping do and by doing it we will leave a legacy. When we depart this earth, we can do so, BODLY as Jesus did. I encourage you to intentionally leave a legacy. Many years ago Becky & I set out to do so and are still working on it. I believe it and try to live it. To the best of my recollection, I came up with this statement and wrote it down some time ago. “THE MEASURE OF MY CHARACTER IS NOT BY WHAT I GET FROM MY ANCESTORS, BUT WHAT I LEAVE MY DECENDANTS AND OTHERS WHO FOLLOW. THE FRUIT OF GOD’S SPIRIT IS REFLECTED IN WHAT I DO, IN WHO I AM BECOMING AND IN THE LEGACY I LEAVE.” I believe that I can LEAVE BODLY when God calls me home. To leave boldly is to leave confidently. Jesus left boldly and confidently when he had accomplished his mission on earth. What is your mission on earth? If you only had one month to live, what would God want you to be doing that you are not doing now? Well, why aren’t you doing it now? If you died today would you leave boldly with the confidence that you had accomplished all God wanted you to do? As we near the end of taking a daily look and examining our lives to answer the question, What If I Knew I Have Only One Month To Live, what would I do differently? I pray that at the end of these Quiet Times you will have answered this question. I remember a funeral I did and one of the sons of the deceased said to me just before the service, “Pastor I have no regrets about my Dad dying suddenly. I said all I need to say and I have peace about his death. He was a man of character.” WOW! God wants to build the character of Jesus in our lives. Let Romans 8:29, which we often leave off the frequently quoted verse Romans 8:28 (HCSB), speak to you as you read and connect the two. “We know that all things work together for the good of those who love God: those who are called according to His purpose.” Verse 29 in the Message says “God knew what he was doing from the very beginning. He decided from the outset to shape the lives of those who love him along the same lines as the life of his Son. The Son stands first in the line of humanity he restored. We see the original and intended shape of our lives there in him.” I don’t often quote the Message Bible because it is paraphrased, but it truly brings out the meaning of the verse so clearly. If we submit to God and obey him, he will build character into our lives from the time we come to know Jesus until He calls us home! Our character should be a testimony to the world that Jesus lives in us. Think about how you have reacted in your contact with the public - cashiers, servers in restaurants, sales clerks, etc. One of my granddaughters works part time at McDonald's and last week a customer yelled at her. When I heard about it, the thought that crossed my mind was is he a believer? Take time to examine your interactions with others and use your evaluation of your actions as your test of character. If you feel you have “blown it,” and can apologize do so after you and God have discussed it. Character is something we take to Heaven. What is the character of Jesus? Perhaps the best way to answer this is with a quote from Scripture in Galatians 5:22-23 (NLT) “But the Holy Spirit produces this kind of fruit in our lives: love, joy, peace, patience, kindness, goodness, faithfulness, gentleness, and self-control.” Think on the life of Jesus and how these character qualities are manifested in his life. Meditate on these 9 qualities. Using your journal or just a piece of paper, rate yourself on a scale of 1 to 10. Be honest and candid with yourself. How you rate is between you and God. If you are really brave, ask your family to rate you or a good friend. CONVICTING, HUH? God builds character into our lives by HIS WORD! This is a chief reason why we need to spend time alone with the Lord and His Word each day. Ask God to show you any areas of improvement you need in living up to these nine qualities. By recording this in your QT Journal, you can review this perhaps each week and measure the progress you have made. In the life of Believers, God uses PROBLEMS to build character. Having just gone through serious health problems, He has and is restoring my health to perhaps better than before the 77 days in the hospital last fall. Speaking from years of experience, and after all this, I know that God has and did build more character into my life. My first reaction to problems should not be to ask God to remove them, but to show me what I need to learn. But my first reaction many times is, “God are you sure I need more character—don’t I have enough?” God probably laughs when I say that! If you are in the beginning or the midst of a problem, ask God what you need to learn, then ask him to remove it. God uses small problems as well as giant ones to build character. John 15:1-2 (NLT) says “I am the true grapevine, and my Father is the gardener. He cuts off every branch of mine that doesn’t produce fruit, and he prunes the branches that do bear fruit so they will produce even more.” When we are under pressure, from various trials or other things that come into our lives, God uses that pressure to prune us, to grow us, to make us more like Him. I always think of how diamonds are created and that is under pressure. We were at the Eiffel Tower in Paris, France some time ago which weighs 10,000 tons. I have read that if you took it and turned it upside down on a 5” square plate on the right substances you could create a diamond. Unlike a diamond, pressure usually brings out the WORST in us. God uses problems and pressures to shape us. He also uses people. I have heard it said that people are Heavenly Sandpaper. God uses them to rub off the rough edges. Some are course sandpaper, some are extra fine and others are like a soft cloth that we use to put a shine on a car or silverware or a nice piece of furniture. Thank you for joining us on this 40 day journey to making quiet time with the Lord a priority. We hope that you have grown closer to God and that your life has been transformed as a result. 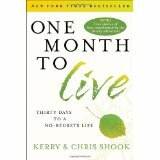 If you would like more information about the book “One Month to Live” by Kerry and Chris Shook, please click on the link below.